Over the past few months, there has been a continuous background roar about stablecoins as more and more projects have been launched. However, in the first half of February these non-crypto digital assets have been losing market capitalization. 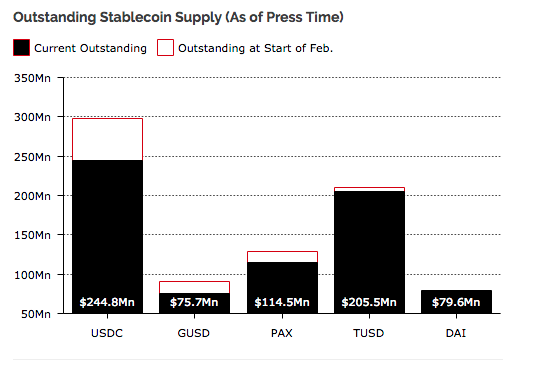 The net decrease of the outstanding supply of stablecoins without accounting for Tether and DAI has decreased in about $100 million or 10%. In a month were the largest bank in the U.S. launched their own stablecoin, upwards price action might be triggering some funds to step off stablecoins into cryptocurrencies. As the graph above shows, with data extracted from Ethersan by Diar, USDC is taking the largest hit, also significant when detrending for project size. Thether’s losses are rather negligible, meanwhile DAI is the only stablecoin increasing its outstanding supply during the current month. 2018 and the beginning of this year have witnessed many new projects getting launched an increasing adoption among those already operating. However, it remains to be seen if the trend will continue, especially if price winds start to blow towards another bull run in cryptocurrencies. even if the stablecoin market is going down one of the most reliable of them tether is showing growth and consistency. it doesn't matter is we still have true coins as tether and dai. Tether is trusted now and other stablecoins not. This is a clear example of what happens with hyped coins a few months after advertising — its price drops down. We definitely don't need more stablecoins especially those mediocre ones like Gemini and Paxos. Stablecoins led by Tether rapidly gain the market expanding the uses for volatile crypto! I won’t be surprised if USDT will gain even more volumes. In the light of their new partnering with Tron, more and more people get attracted by it. USDT was the first non-volatile coin, I remember how it started, nobody believed in it and now we have what we have. Stablecoin world is adopting new Tether analogs. New dollar tokens are released monthly and its growth in number is quite tangible. I think Tether can go even higher. Check the last news just!